Have you ever gone to a nursery and discovered no one knows anything about plants or purchased plants online that were given misleading or inaccurate growing information? If you've ever wanted to shop at a nursery where the owners are actually gardeners, then head to Gossler Farms Nursery. Located in Springfield, OR, Gossler Farms is one of those amazing places that is owned and staffed by real gardeners. Home to some of the coolest plants around, Gossler Farms has been in business for 48 years and sells and ships year round. 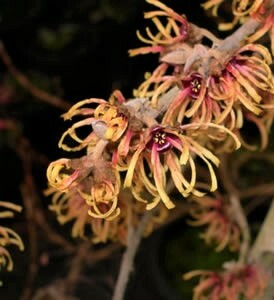 Run by the Gossler family, they specialize in shrubs and trees and are home to 65 varieties of magnolia and 43 types of witch hazel (hamamelis), all of which are available online. Their plants are huge so don't be surprised when a giant box arrives on your doorstep with a robust plant carefully tucked inside. The nursery is also home to a three acre display garden full of carefully selected shrubs and trees. So vast is their knowledge, they've written a book. If you're in the Springfield/Eugene, Oregon area they nursery is open to visitors if you call ahead. Roger is even available as a garden coach. There is something about functional beauty I find irresistible. Maybe it's the idea of finding or creating beauty in that which doesn't have to be beautiful. It's a reminder in a world full of images both tragic and disturbing that the smallest things can be simple works of art. Some of the first seeds I grew came from Botanical Interests seed packets so pretty I'd stopped to enjoy the tiny paintings on the cover before deciding to buy them. 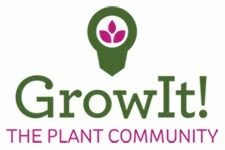 Started by Curtis Jones and Judy Seaborn in 1995, Botanical Interests has grown from a tiny company based out of their living room to one of the most trusted sources of seed in the US. 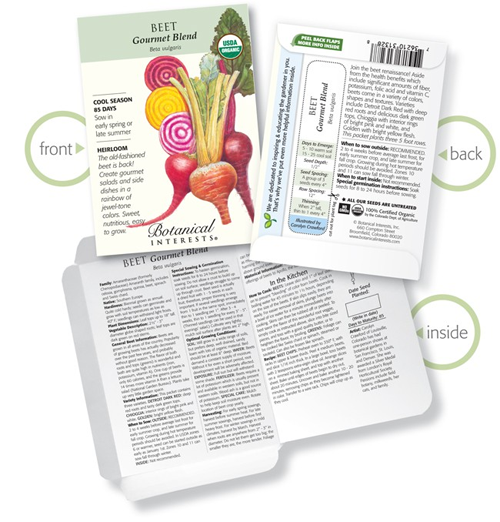 Offering over 600 varieties of seed, all seeds from Botanical Interests are non-GMO and untreated with pesticides. 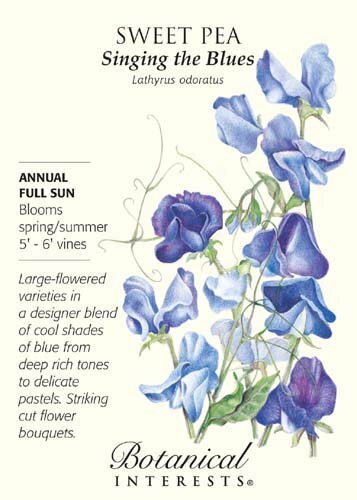 In addition to being beautiful, the seed packets from Botanical Interests are packed with useful, realistic information to help you germinate and grow your seeds successfully. Filled with high quality seed grown in the US, they offer us the chance to create our own works of art through gardening, whether it's a few flower seeds scattered in an empty pot or a field full of vegetables. We all need more beauty and happiness right now. Why not start with some seeds? Annual rudbeckia hirta gently self-seeds in my garden. The pots in the background contain zinnias grown from Botanical Interests seeds. Maybe it's because I'm a California native with memories of drought, hot, dry winds, and a deep understanding of how quickly a single flame can bring down an entire neighborhood, but I have a huge respect for any plant that doesn't want to be watered. Despite living in the occasionally soggy mid-Atlantic, I've stuffed my Virginia garden with as many low water plants as possible. This summer I'll be adding more from Mountain Crest Gardens, a family owned California nursery that specializes in succulents. 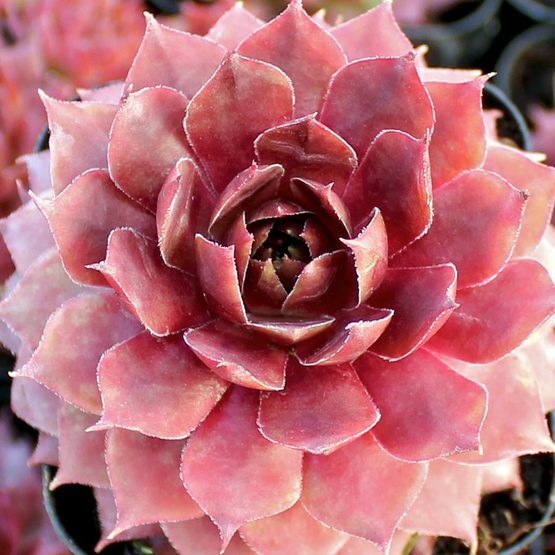 Mountain Crest sells over 650 varieties of succulents, including Sempervivum (Hens and Chicks), Sedum, Jovibarba heuffelii, Echeveria, Crassula, Haworthia, Kalanchoe, Senecio, Aeonium, succulent ground covers, and more. 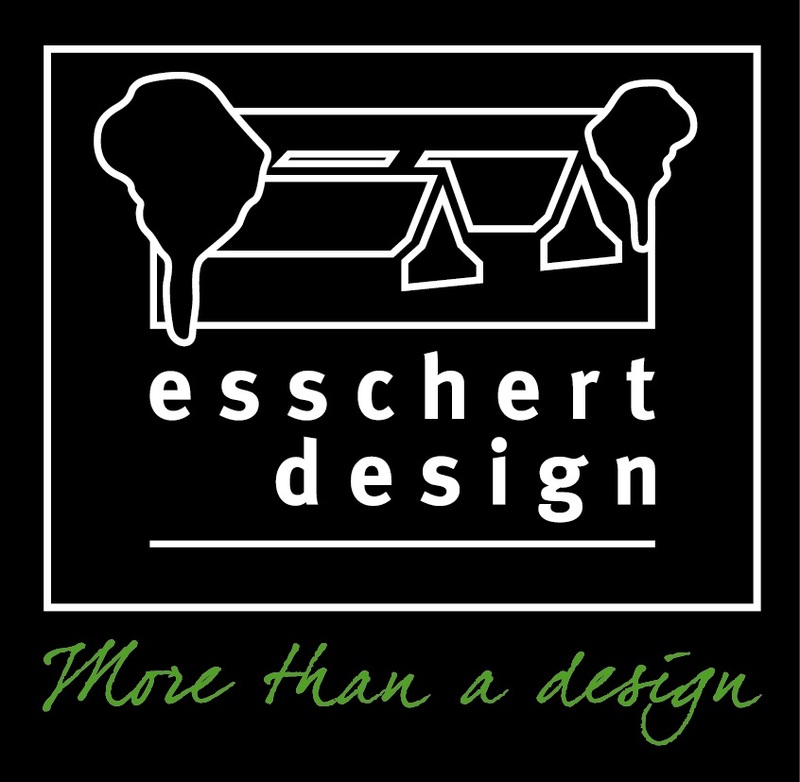 Their plants are perfect as houseplants, ground cover, lawn replacement, wedding favors, terrariums, fairy gardens, wreaths, and more. They ship to all 50 states and Puerto Rico. There is no minimum order and shipping is free on qualifying orders within the continental US. With a selection this enormous, it's easy to find the right plant for every climate and project. 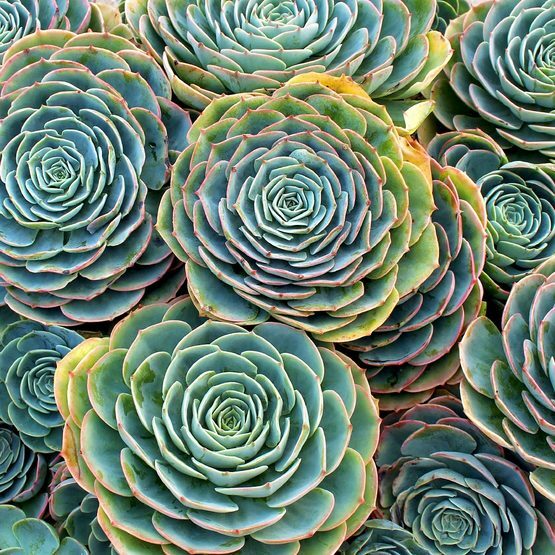 Plants that rarely need to be watered? What's not to love! Maybe it's because I'm the daughter of a Navy sailor who married an Air Force aviator, but I've spent my life surrounded by people who aren't native to where they currently live. There is a lot to be said for sharing a meal with people who come from different parts of the US and realizing, despite different accents and perspectives, we have more in common than we think. Having spent many years in the mid-west, I quickly learned the plants, like the people, need to be tough. If you're looking for plants as undaunted as the prairie, head to Grimm's Gardens. Plants are available both online and at the nursery. 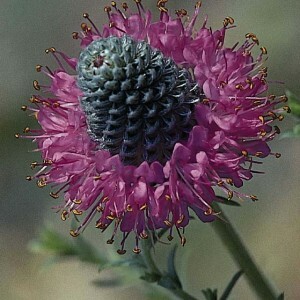 Dalea, a tough prairie native, is available from Grimm's Gardens. Every plant sold at Grimm's has been trialed to determine if it will thrive in hot mid-western summers and cold winters. 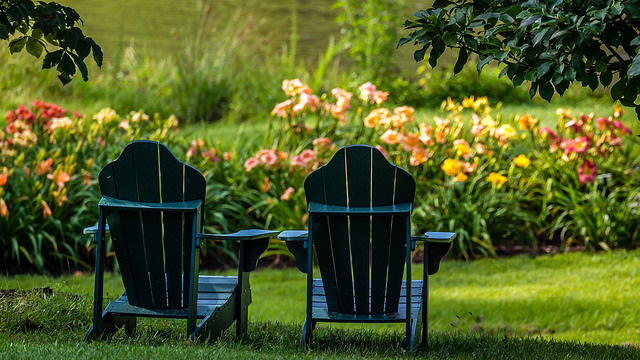 The skilled, educated staff are experts on trees and shrubs tolerant of the mid-western climate. Perennials, annuals, grasses, roses, fruiting plants, and vegetable starts are also sold. They offer monthly specials and free shipping on qualifying orders. Grimm's has a large selection of drought tolerant plants that attract pollinators, such as orange milkweed, asclepias tuberosa. Unlike many nurseries that sell plugs or seedlings, Grimm's sells and ships large, mature plants like those found at local garden centers. When you open your order, robust, healthy plants will be waiting! 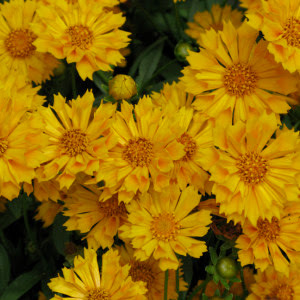 'Jethro Tull' coreopsis is currently on sale. I love it when gardeners describe themselves as plant addicts, with no apologies or explanations. Leonard Foltz and Fred Weisensee of the spectacular Oregon nursery Dancing Oaks are passionate gardeners and enthusiasts of unusual and unique plants. Their idea of a vacation is a plant collecting expedition to South Africa or Chile! 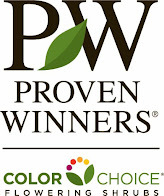 Dancing Oaks ships nationwide and only sells plants of the highest quality. Grown on site at their nursery or through reputable growers, trees, shrubs, and perennials that "merit cultivation and appreciation" are offered through on site sales as well as their website. 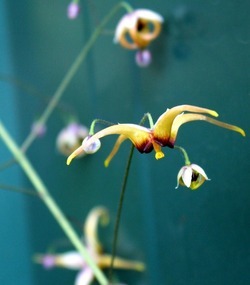 Biennials, ferns, bulbs and tubers, vines, grasses, and bamboo are also offered. 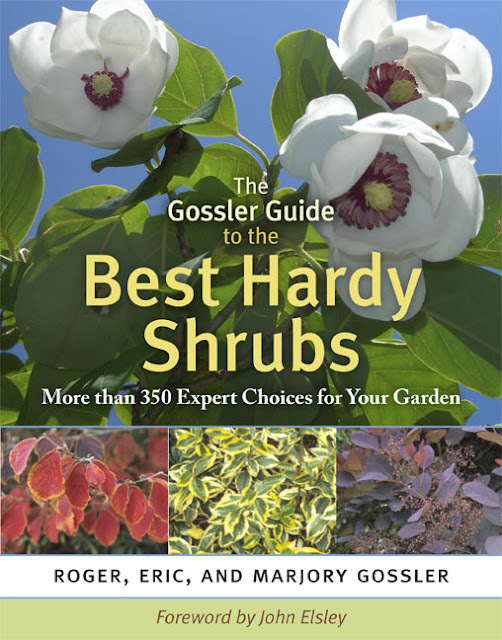 Their online catalog lists helpful and humorous information about each plant. For gardeners in the area, their nursery is surrounded by gorgeous display gardens and features a pavilion perfect for group events. "In concert with the plants in the garden are water features, xeric gardens, metal sculptures created by local artists, a vine covered cedar pergola, hand made glass art and urns and pots for garden ornaments." For more information about Dancing Oaks, check out Grace Pete's blog post about her visit to the nursery. I am convinced a container is as capable as my garden beds of holding any plant I love provided the container is large enough. Every year I put this to the test by planting sweet potatoes, a space hogging tuber fond of long, hot summers, in containers on my patio. While this seems like a recipe for failure, it's not. Southern Exposure Seed Exchange specializes in herbs, flowers, and vegetables that thrive in the southeast. Their Bunch Porto Rico sweet potatoes are designed for small spaces and fill my containers with enough spuds to mash into a casserole for Thanksgiving while spilling their foliage around my other pots, giving my container garden a lush, tropical feel. Specializing in organic and heirloom seeds and starts from their cooperatively run business, Southern Exposure Seed Exchange is an excellent company with a reputation for integrity and responsibility. All of their seed is non-GMO and produced by local farmers. What do you do when you just can't find the right plant for your problem spot? I turn to family owned Bluestone Perennials and their Plant Finder. 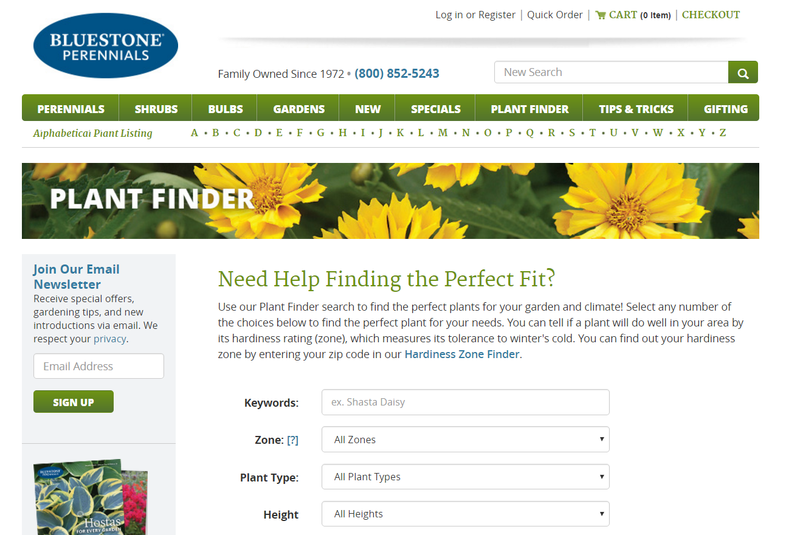 Most gardeners have an online nursery or information source they rely on to help them solve their design dilemmas. Bluestone is one of my favorites. 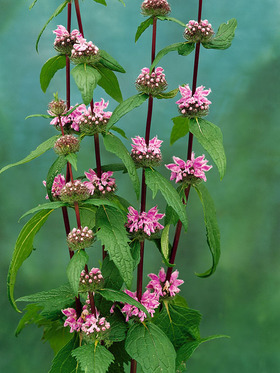 I added phlomis tuberosa to my garden this fall after seeing it suggested as a tall, butterfly-attracting plant for a hot, dry site with bright, partial shade. The descriptive information that accompanies each listing lets you know how to best use the plant by listing its attributes. The other plants I was considering were plastic tulips so I was grateful to have an alternative. We're All Coming to the Fling! Are You?? Now that we've hung our new calendars, it's time to fill in a few blocks for some garden blogger fun! Listed below are the bloggers who will be attending the 2017 Capital Region Fling June 22 - 25, 2017. Register today to add your name to the list! SPECIAL NOTE: The gardeners and landscape designers who are showing their gardens will be joining us for the Fling! Lazy S's Farm Nursery: I'd like three of everything, please. Every spring and fall I wait eagerly for my shipment from Lazy S's Farm Nursery in Barboursville, Virginia. Gaps in my design or empty space in newly expanded borders are always filled with perennials from their massive online nursery. When the plants at the local nurseries are picked over or they've never heard of the specific cultivar I've decided I can't live without, I head to Lazy S.
Lazy S's Farms Nursery is sponsoring the garden at Casa Mariposa, one of the stops on the Fling tour. Many of the plants in this photo are from Lazy S.
How many plants does Lazy S feature in their expansive online nursery? A zillion. The plants are grown without growth inhibitors or neonicontinoid pesticides and can withstand the heat and humidity a Virginia summer dishes out. Unlike the vague write-ups often featured on plant tags, owners Pete and Debbie Scheuchenko give you the honest truth about what to expect from each plant. I spend as much time on their site just researching plants as I do shopping. 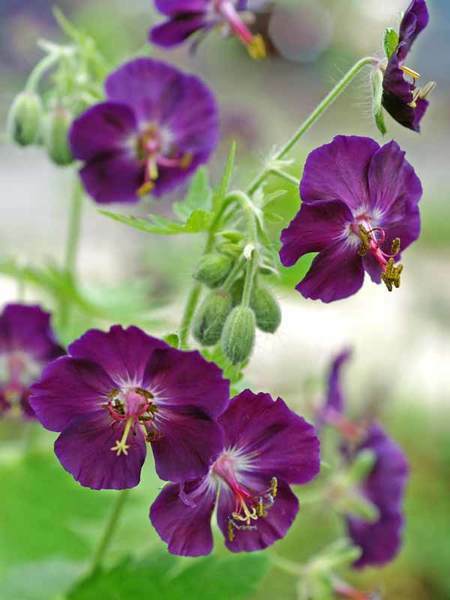 The detailed plant descriptions tell you the country of origin and types of wildlife attracted or repelled, as well as necessary growers information. North American natives such as purple coneflower, as well as ornamentals, are available at Lazy S.
Their plants arrive expertly packed, well rooted, and full of lush growth. Instead of paying expensive east coast garden center prices for small plants sold in giant pots, you'll pay a fair price for a sturdy, pesticide-free plant with a sizable root ball. As the sponsor of the Casa Mariposa garden, bloggers at the Fling will be given a plant list of every plant in the garden purchased from Lazy S. Each plant will be marked with special decorative markers that correspond to a numbered list. ** This is the first in a series of articles about the companies sponsoring the Fling. 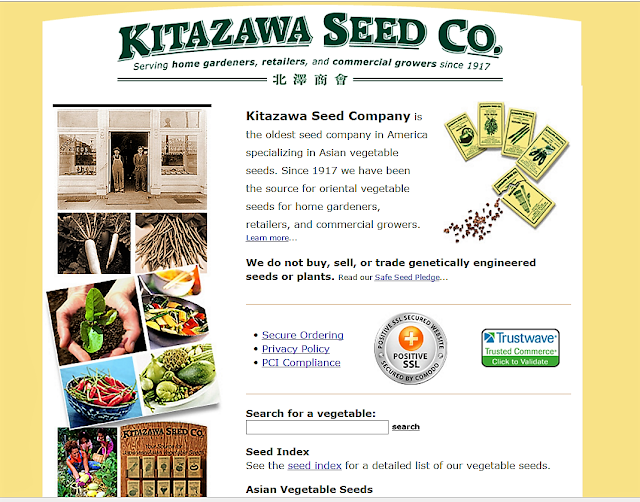 In an age where large corporations routinely devour small companies with the enthusiasm of a starving teen in a pizza shop, Kitazawa Seed Company is about to celebrate its 100th anniversary. Started as a family business in 1917 to meet the needs of Japanese immigrants eager to grow traditional crops, Kitazawa soon became the main source of seed for the growing Japanese-American community. Forced to close the business from 1942 to 1945 when the Kitazawa family was sent to the Heart Mountain, Wyoming internment camp, they restarted the company after World War 2 ended. They began shipping seed across the country to other farmers and home gardeners who had lost their land and were no longer living on the west coast. As lack of agricultural diversity reduces the varieties of vegetables available to the home gardener, companies like Kitazawa become a beacon of preservation. Kitazawa Seed Company sells over 500 varieties of seed, including traditional Japanese vegetables. Custom seed mixes are available for gardeners looking to grow microgreens or specific vegetables to use in juicing, as well as many others. Their seeds are grown in Japan and many other countries across the globe as well in the US. To reflect the changing cultural landscape and palates of their customers, vegetable seeds for varieties grown around the world have made their way into the stock sold by Kitazawa such as Spanish padron peppers and Middle Eastern molokhia. Recipes that feature the vegetables they sell can be found on their website. Owner Maya Shiroyama, who grew up tending vegetables grown from Kitazawa seed, still tests new varieties in her home garden and guarantees biological purity for every seed they sell. They do not buy or sell any genetically engineered seeds. 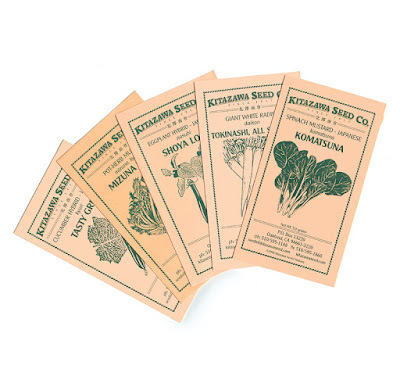 To request a catalog and purchase seed, visit their website at Kitazawa Seed Company.